Kingpins Amsterdam, taking place this week on April 10-11, kicks off the Fall/Winter 20-21 season for the global denim market. With the demand for efficiency, and sustainability reverberated across the entire supply chain, attendees can expect new sustainable concepts that aim to eliminate resources and speed up production. Italian finishing technology company Tonello will introduce Metro, a new software designed to measure data relating to the consumption of individual garments. The company will also present a collection of “eco-dyeing” achieved through low impact technologies that reduce the consumption of water, additives and energy by 70 percent. Lenzing is fine-tuning its messaging with the Sustainability Storybox, which will highlight circularity, traceability, upcycling and compostability. The Sustainability Storybox will feature Planet REhab, the collaborative effort by Lenzing, Tonello, Tejidos Royo, Officina+39 and Guatemalan designer Juan Carlos Gordillo, who brought color and feminine flourishes to the denim garments. The sustainable collection was designed around Tencel and Tencel x Refibra lyocell fabrics from Tejidos Royo. Garments were dyed using Officina+39’s Recycrom technology—a dye stuff made from 100 percent recycled materials—and sustainably finished by Tonello. Cradle to Cradle (C2C) certification is gaining momentum in the denim category. The Lycra Company will showcase Lycra fiber 166L, which was recently awarded a gold level certificate by the Cradle to Cradle Products Innovation Institute. “By specifying Lycra fiber 166L in denim and woven fabrics, mills, brands and retailers can be assured of transparency about the product’s ingredients and suppliers as well as The Lycra Company’s commitment to continuously improving the sustainability profile of its products,” said Jean Hegedus, ready-to-wear director for The Lycra Company. The company will also present EcoMade versions of its popular Lycra T400 and Coolmax fibers made with recycled components. Zero waste denim is top of mind of Artistic Milliners. New C2C gold certified spandex fibers now allows the mill to offer C2C stretch denim. The fabric is dyed with the mill’s Crystal Clear Clean indigo dyeing technology, which uses an organic fixing agent that requires no salt and 70 percent less chemicals compared to traditional dyeing. The hydro-free dye process leaves clean and recyclable water effluent without any salt by-products. Soorty will introduce a new color “Neutral Blue” to its line of C2C denim fabrics that it launched last year. The mill will also introduce “the world’s first clean liquid indigo” with Archroma to make aniline free denim. And with trends running the gamut from nostalgia to performance, Soorty designed its new collection to address the specific needs for different consumer groups. The Nostalgia collection welcomes new extreme twills, heavier fabrics and selvedge. Inky shades of dark indigo, canvas for slouchy silhouettes and non-denims in shades of ecru and white live here. With winter whites shaping up to be an important story for the season, Soorty is growing its non-denim assortment to include a variety of twills, weights, compositions and constructions. Meanwhile, the mill’s High Energy collection packs performance properties like Forever Black and Rain Shield, a lightweight water repellency. Black plays a key role in Prosperity Textile’s collection, which will present a range of black denims from Phantom Black and Midnight Black to a newly-developed Ink Black. The mill is also working on a collection with a cotton-less approach, featuring more recycled ingredients like Sorona, Tencel x Refibra lyocell and Repreve. Artistic Fabric & Garment Industries (AFGI) is placing an emphasis on fabrics made with its Double Zero technology, which combines Zero Waste Water dyeing with Zero Waste Water finishing. The result (verified by two third parties) is no discharge water at the end of both dyeing and finishing processes. “An important benefit of our Double Zero technology is that all the indigo shades using this technology are highly laser sensitive, enabling aesthetically pleasing laser designs while reducing laser-machine timing,” said Henry Wong, AFGI product develop and marketing director of North America. Additionally, AFGI will introduce new colors and fabrics in both indigo and grey achieved with its Zero Bleach Technology. Wong added that the colors can easily produce light-colored washes without the use of bleaching agents like sodium hypochlorite. In a collection called “ReThink,” House of Gold reformulated one core fabric and one novelty to include recycled cotton and recycled indigo. The collection includes a stretch, a non-stretch and a canvas. “Since the recycled indigo was already dyed, there is no need to re-dye, which saves water, time and energy,” said Gary You, House of Gold director of strategy and product development. Blending performance with heritage and fashion is at the base of Bossa’s F/W 20-21 collection. The mill will introduce a brand-new finishing technology called Eversoft, which Bossa says results in the “softest denim in the blue world.” The new technology complements the mill’s Techknit family, a new range of woven fabrics with a knitted look and the new Xplay collection of bi-stretch fabrics. Over dyes, leather and metallic coatings and laser friendly dyes are among Bossa’s arsenal of novelty items, as well as crosshatch comfort fabrics and velvety corduroy denim. Calik‘s F/W 20-21 collection, called Eudemonia, reveals the mill’s new approach to sustainability. The mill announced plans to adopt D-Clear technology across its entire product range by 2025. D-Clear technology uses 40 percent less water in indigo dyeing and 83 percent less during the finishing process. Additionally, the technology reduces the volume of chemicals used per meter of fabric by 94 percent. The mill is also working to eliminate the difficulty of finding the right size jean by expanding its range of Selfsized fabrics. The fabrics fit a wide range of different sized wearers due to its ultra-high elasticity. In the new collection, Calik showcases Selfsized fabrics with a more authentic denim look salt and pepper effects and vintage washes. New slubby surfaces are well-suited for men’s jeans. 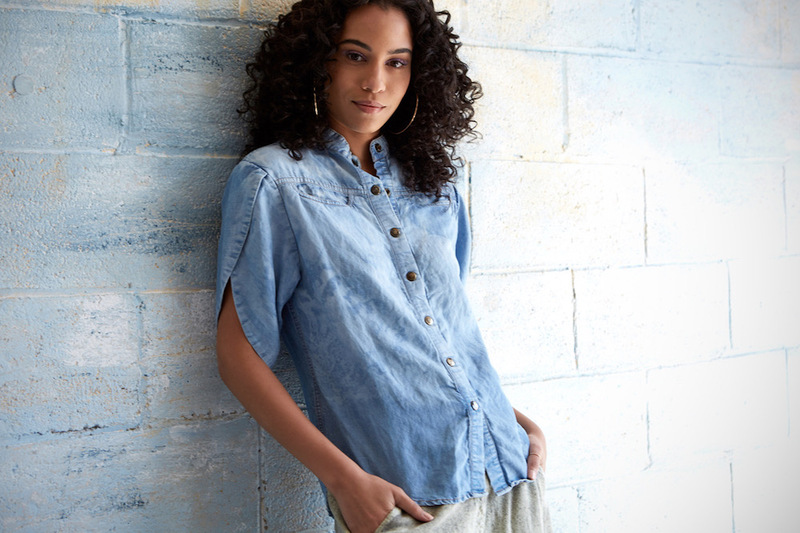 Cone Denim is introducing denim made using Dystar’s Cadira denim dyeing process in a new collection called Distilled Indigo denim, making it the first in the Western hemisphere to offer the water-, energy- and chemicals-saving dye solution. The collection combines Dystar Indigo Vat 40% Solution with the eco-friendly reducing agent Sera Con C-RDA to create a salt-free dye that eliminates hydrosuphite. Distilled Indigo denim will be offered in Cone’s Modern Retro capsule.